I have always been a bit of a Francophile, especially when it comes to food. The French just have a way of making the kind of food you want to bathe in because it feeds the spirit not to mention the taste buds. 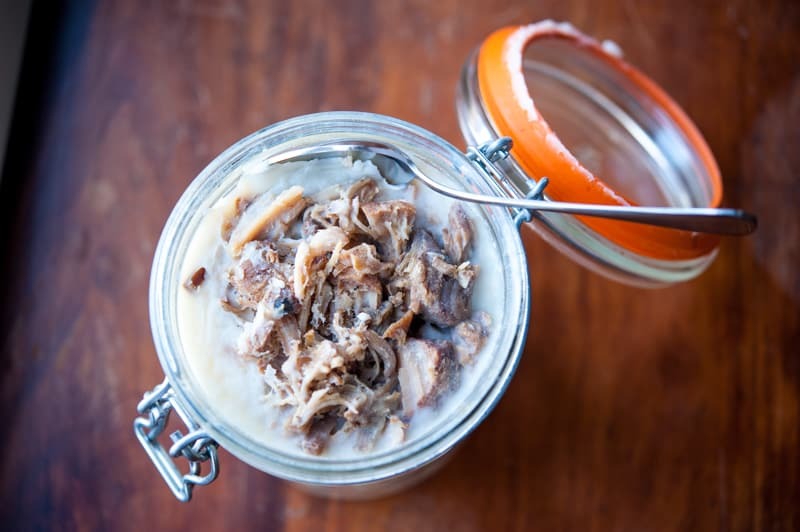 Rillettes are an example of just that, they are a way to prepare and store meat, and taste similar to a pâté. The meat is typically cubed or chopped, salted heavily and cooked slowly in fat. Fat! My favorite food. 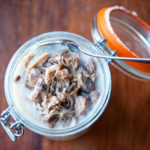 The slow cooking in fat makes it tender so that it can be easily pulled apart and shredded until it forms a kind of paste. It is often stored in a nice jar and spread on toast. 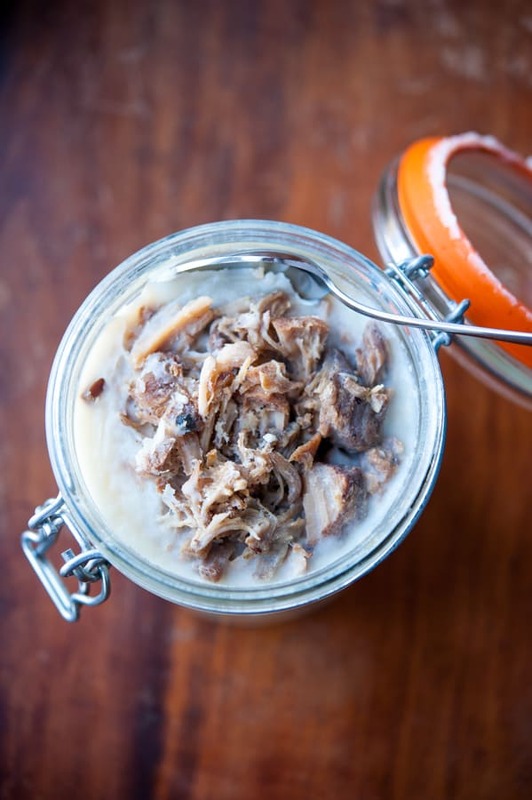 I decided to make a wild boar rillettes for you to try. 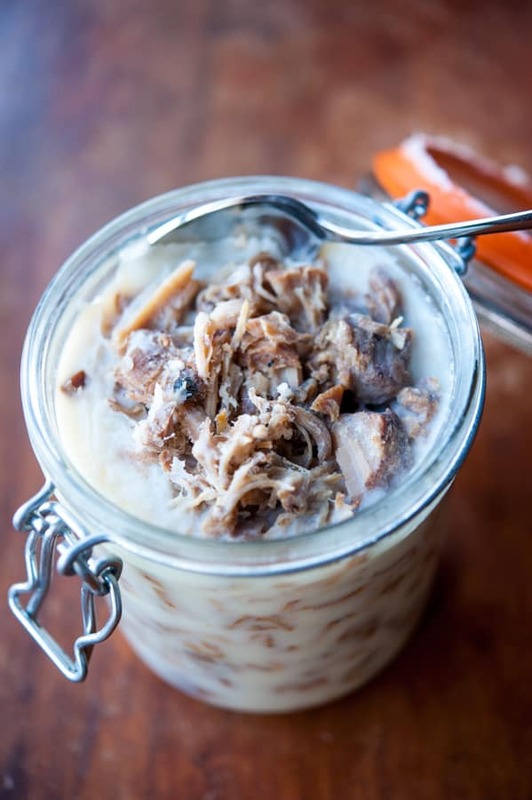 You will need to use domestic pig fat because wild boar don’t tend to have much fat. But the wild boar meat will be earthy and wonderful, or if you use domestic pig meat, get a heritage breed that has been feasting on nuts and acorns, the taste is just so different and dynamic. For the most vibrant flavor in this rich-tasting pork, grind the spices yourself in a coffee or spice grinder. 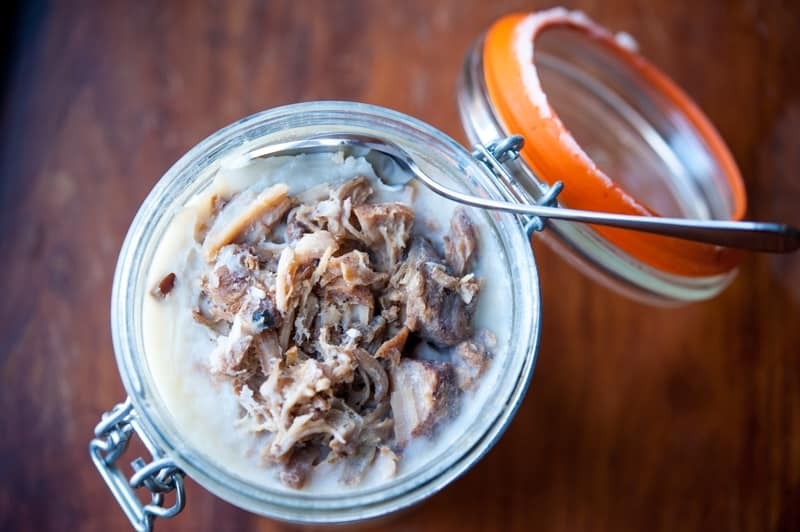 Serve these rillettes with toasts and pickled condiments to balance out the fattiness, or stir them into a pan of scrambled eggs in the morning. A glass of wine with strong tannins, such as shiraz or cabernet, also complements their flavors. 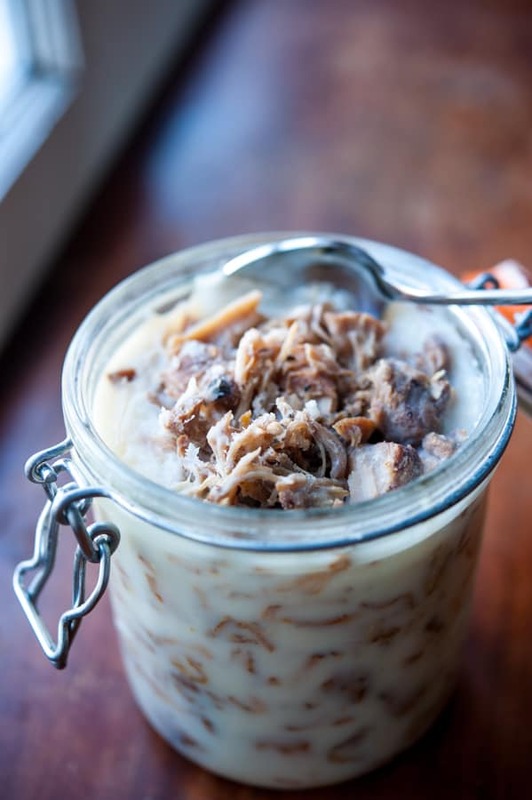 You can make this ahead of time and refrigerate it for up to 1 month by keeping the meat covered with a layer of fat such as what is already in the jar or by adding olive oil. 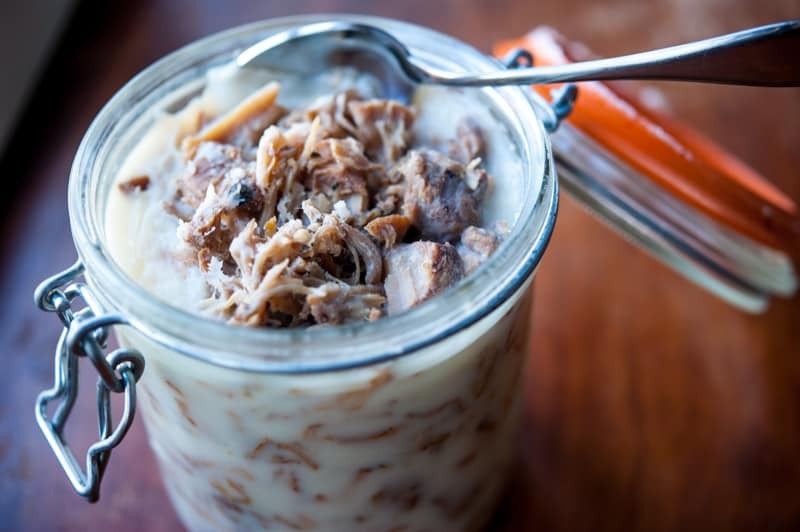 If you don’t want to render the fat yourself, rendered pork fat is available at farmers’ markets, online, and in some specialty or butcher shops. I think you will love this one. And since we are entering into the season, peruse my other Wild Game Recipes for inspiration. They are interchangeable with other meats. Add the peppercorns, coriander, cinnamon, salt, and nutmeg to a large mixing bowl and mix well. Add the pork and toss until well combined. Add the thyme and garlic cloves, cover the bowl in plastic, and place it in the refrigerator overnight. Preheat the oven to 300°F. Place the pork in a 9 ×13-inch baking dish and cover with 2 cups of melted fat. Cover the baking dish with aluminum foil and place it in the oven. Let it cook for about 3 hours, or until the meat can be easily pulled apart with a fork. Remove from the oven and let cool. Using two forks, shred the meat while it is still in the baking dish. 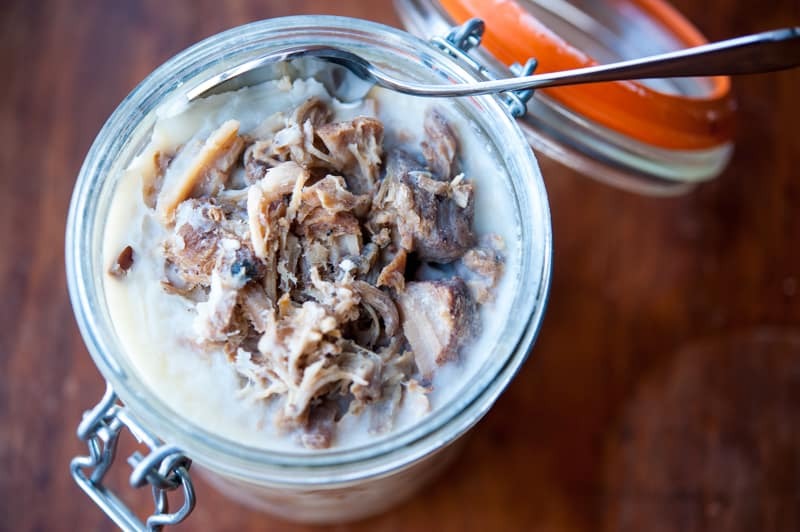 Using a large spoon, scoop the meat and fat into mason jars or crocks. Discard the thyme stems as you do. Cover the tops of the jars with the remaining 2 cups of fat, let come to room temperature, and seal with a lid. Store well sealed in the refrigerator or cool basement for up to 1 month.